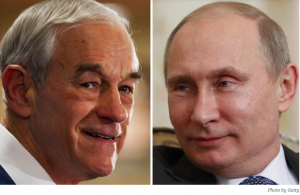 Ron Paul Is Supporting Putin’s Illegal Occupation of Crimea? “In the Crimea crisis, it seems Ron Paul thinks that libertarianism stops at water’s edge,” writes James Kirchick at The Daily Beast. In 2008, when Ron Paul was running for the first time against Barack Obama (et al), and his popularity was surging, I myself wrote an article critical of Ron Paul — an article entitled The Apotheosis of Ron Paul — which was published in a local newspaper, and which, somewhat to my surprise, generated a great deal of anger from people nominally on my side. Now, just over five years later, I often find myself equally surprised at how frequently people still ask me about that article — mostly when I’m working. My answer: I stand by everything I wrote in the initial article, and Ron Paul’s recent remarks anent the Crimean crisis illustrate nicely why. Eh, I got hip to this little schmuck when he snapped at the 2008 debates. The veins in his forehead were bulging as he screamed and yelled trying to defend some absurd crap national policy. While others may or may not agree with his foreign policy he’s clearly not the kind of man with the kind of composure needed in the presence of a nuclear arsenal. I’m surprised no one in the audience ran up and slapped a diaper on him.